Freshly Fried Doughnuts cooked in just a couple of minutes. Yes! you can make up to 12 doughnuts at any one time and they are cooked, sugared and served in just a couple of minutes. This doughnut service can be provided from a vendor’s cart or served from a table upon you trade show stand. Fill the air with this unforgettable aroma of this seaside associated fun food. 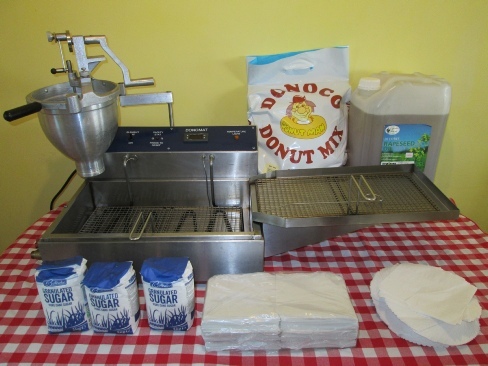 Donut Machine Rental; These mobile doughnut fryers can make up to 400 freshly fried standard sized doughnuts per hour or 600 to 800 mini donuts per hour. 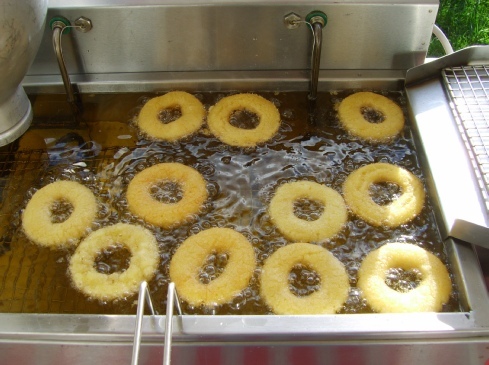 The donut fryer comes with a manual dispensing hopper (one revolution (360 degrees) forms a doughnut. Available by PDF of attachment is our price list on sale of donut consumables, upon request. Dimensions: 500mm x 1100mm x 650mm. Limited promotional area due to size and the hot surfaces. Top half on front: 120mm x 500mm. Hopper (pear shaped): 100mm x 680mm diameter. Alexandra Palace, Business Design Centre, Bournemouth International Centre, Donington Exhibition Centre Donington Park, Earls Court, Epsom Downs Racecourse ExCeL, G-Mex Centre, Hilton Brighton Metropole Hotel, Manchester Central Convention Complex, Novotel London West, Beaumont Conference Centre, National Exhibition Centre, Old Billingsgate, Olympia, Queen Elizabeth II Conference Centre, Ricoh Arena, The Royal Armouries Museum, Sandown Park Exhibition and Conference Centre, Stoneleigh Park, Telford International Centre, The O2 Arena, The Brighton Centre, Cardiff International Arena, Uxbridge University, N.E.C.